A ponderable issue that shows more prominence around the holiday season involves that of food guilt. How do we cope when we overeat, when we want to overeat? Do we even dare? If this is something that is close to your conscience, then you’re not alone. At Vermont Harvest, we know that self-indulgence is an intrinsic part of holiday festivities. We also know you can be smart about it. 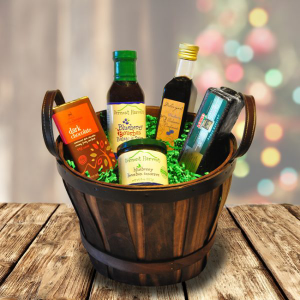 We’ve carefully selected our ingredients and put them in holiday gift baskets that will lift your spirit for the holidays. Many nutritionists suggest re-adjusting this type of thinking to a more guilt-free approach of eating, to go in the direction your dinner fork points you, but in a smart way. Berry-anything is popular around the holidays, and it’s a savory ingredient for the overindulgent: think sorbet, fruity tiramisu, and your grandmother’s homemade pie, but in the form of mouth-puckering condiments. Our blueberry pickings include our classic Blueberry Bourbon Balsamic Sauce which makes a perfect marinade, and Blueberry Bourbon Conserve, an excellent topping for ice cream. The best snacks create the best atmospheres. It’s true; people like to eat together, and when they’re eating well, the fun keeps rolling. Tuscan herb is a seasonal flavor full of zest, and your friends will love dipping your homemade bread into our Delavigne Tuscan Herb oil, made exactly for this activity. We’re replacing Santa’s naughty and nice list with this savory sugar and spice list, and it’s filled with locally-made goodies, including our Tiger Satay Peanut sauce, which we use on pizza. Are you ready for a little more kick? Spread our Jalapeno Pepper Jelly onto your favorite holiday egg roll and fondue appetizers for a wonderfully explosive experience. There’s more Vermont Harvest where this came from; we also have a delectable line of gourmet shortbread that is popular for the holidays. 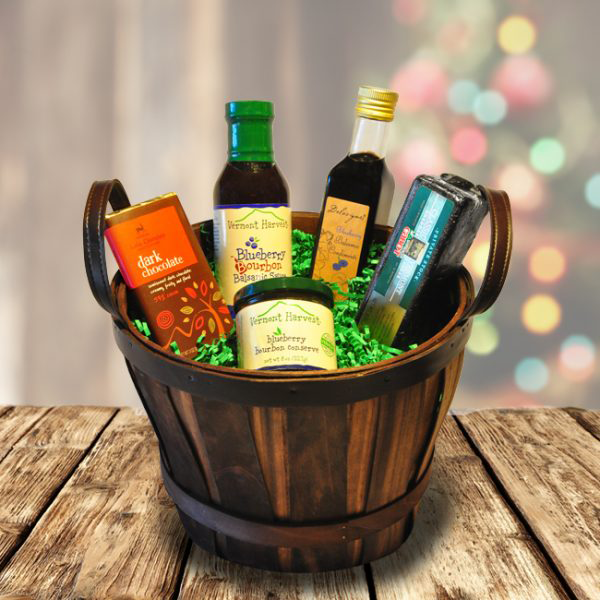 Visit our gift basket page and shortbread selection for other seasonal favorites! We are offering free shipping on online orders over $30 until January 30th. Use the Holiday18 coupon at checkout!